Recently Nadine Lockhart caught up with Kamilah Aisha Moon, whose poetry and prose appear in Superstition Review Issue 10. Nadine Lockhart: The relationship your sister has with you, you with her, the entire family dynamic, and her interactions with the rest of the world (her impact on those around her, and how she is affected by them) are central to—but “slantly” told in—She Has a Name. What was the impetus, emotional or otherwise, for choosing to write about your sister? Was to educate others part of your decision as the title of the book seems to indicate? Kamilah Aisha Moon: The idea of telling, and thus owning, one’s story has always been present through music, the books lining my mother’s shelves and the literature introduced in church and school from a very young age. And I wrote about everything but that relationship and how it shaped our family because it was too close, like trying to read a book pushed up against my nose. My attempts were trite and inadequate for a long time. I still don’t feel like they are all that they could be. I needed time and distance as a woman in order to circle back with enough perspective to go there in a meaningful way. But I felt like I had to because there was a long silence and a subtle yet pervasive shame around difference in the communities we grew up in. I think this often happened inadvertently—just not having the information or language on a wide scale at the time to facilitate conversation and interaction. I needed to make sense of what I’d seen and heard, intuited but hadn’t discussed with others. Visibility and pride, as well as promoting understanding definitely brought me back to this subject. And to not write about her and this condition would have been to ignore a significant part of my own journey. NL: The book begins with “Borderless Country,” possibly akin to a reader’s introduction to autism as the poem oscillates between cold statistics and a mother’s inner dialogue. How did you decide on this work as the first poem of your first book? How did you come to the title—which is a very apt description of what it must be like to navigate life for those with autism. KAM: “Borderless Country” is an acknowledgement of how many families in this country are affected by this condition across all backgrounds and walks of life. Since writing that poem, that statistic has increased to 1 in 88. The perimeters of the autism spectrum and its criteria continue to evolve and shift, and the poem is a brief litany of questions, possible causes and the initial grappling after diagnosis. It felt right to start broad and then zoom into a specific story. NL: Embedded, among the titled poems throughout the book, are what appear to be theatrical asides spoken by different members of the family. They are untitled, but for the speaker’s name in parentheses; however, when your autistic sister speaks, you do not name her, which seems to echo the book’s title. What was the initial idea behind these “rests” inserted into the main musical score of the manuscript? What do you feel they do for the reader, or what did you hope they would do? KAM: The only name that appears in the book at all is my nickname, Ish. These are characters based on real people. I want the reader to always be aware of this fact. The sister’s “voice” is left- justified, the title character needs no modifier. But the whole point as well is similar to the impetus behind the poem “Borderless Country.” This is any of us, all of us. Unsure of how to handle something we don’t understand, perhaps misplacing anger or shutting down for awhile. Or simply taking your sister or daughter to the park, or sitting in a meeting with an apathetic teacher, etc. Most people have found themselves frustrated by their own limitations, as the autistic sister mentions. As children when we met new people, sometimes they wouldn’t acknowledge my youngest sister, so we often would do it for them—“and her name is…” She is able to express herself, and has become more eloquent as the years go by. No matter what our individual struggles, we are self-determining and wrestle with our desires and needs. We are all here. We each and all have a name. NL: The poem, “Frequency: An Ultimatum,” is one of my favorites; it is very different in sound and form from the others in the book. Was it written earlier? Later? What were the circumstances of its creation? KAM: I wanted to “talk back” to the voices that my sister sometimes responds to out loud. I wanted to somehow capture the way she seems haunted and how we all resent their unwelcome intrusions. And express the helplessness of not being able to do anything but be there, try to soothe her when she gets upset. NL: Another poem, “Blues Bop for Sonny,” includes a refrain and I could almost hear it as a song—as the title suggests. I’ve heard you say how much music has been an influence on you and your work. Did you have something like that in mind, ie, setting this poem to music or hearing it as a melody or even writing it as a song, initially? What role did Sonny Kenner play in your life, artistic or otherwise? KAM: The Bop is a poetic form created by poet Afaa Michael Weaver born directly out of the blues tradition of storytelling with a refrain. I didn’t originally write this poem as a bop, but found it to be a natural fit since Sonny Kenner played both blues and jazz for years with several renowned musicians in Kansas City, MO. Also, the circumstances at the end of his life were a blues of its own, and unfortunately that is a common irony. I love live music sets and I used to go to his shows when I lived there, and was dismayed at how his passing was handled by the local news. The poem was a way of “seeing” him in a dignified way and remembering his gift. NL: Of course, I resisted and resisted, but by the end of the book, I was sobbing. Have others mentioned this? Did you realize your poetry would have this effect? Was it intended? Would you elaborate on this kind of emotional release for the reader? KAM: There have been strong emotional reactions from readers. I tried to write with empathy and as much of the original emotion felt as possible. William Stafford said, “Dig deep enough into your own story until you reach everyone’s story,” and this has been a guiding concept for my writing. I also kept in mind the idea that if there is no surprise or discovery for the writer in process, there won’t be any for the reader. Lucille Clifton often said “Something in me knows how to write poetry better than I do.” I wanted to get out of the way of the part of me that ‘knows’ better; to listen and receive rather than dictate. So I allowed myself to excavate places that weren’t comfortable and to write what came—especially when it didn’t match what I may have planned to write about. It is special to be told that you’ve increased someone’s awareness or sensitivity, or affirmed someone else’s experience in a way he or she hadn’t been able to articulate before. In a world that has a great deal of isolation and ignorance, moments of connection and clarity are godsends, I think. NL: Even though semi-autobiographical, She Has a Name is not running exactly alongside the lives of the people we discover within the text. For example, your father was artistic, and so his emotions were probably not as blunted as those portrayed in the father in the book. And aren’t both he and your sister still living, so “Eulogy” is fictitious, yet one of the more heartbreaking, and at the same time, more hopeful poems in the book. Could you elaborate on your process of where to draw that semi-autobiographical line? KAM: This collection is based on a shared experience in several lives full of innumerable experiences. So while it explores the truth of real emotions and events, it could never represent the whole of any person or experience. Elizabeth Alexander said “many things are true at once.” Truth also has many faces. These poems are sketches of very rich, textured, full lives filtered through the colander of one person’s memory. Tiny windows into a mansion of realities. I wanted to honor the challenges and beauty of what is unquestionably a deep, abiding love among all members of the family. “Eulogy” is for my Aunt Joy, who passed away at the age of 28. Her untimely passing had a deep impact on our family. Nadine Lockhart received both her MA and MFA from Arizona State University; she is currently enrolled in their PhD program. She is co-host/co-founder of the Phoenix Poetry Series, a monthly featured reading in central city; it’s in its sixth year. Her interests, in addition to poetry, include the visual arts, theatre, and Badger, her orange cat. Kamilah Aisha Moon’s poetry collection, She Has A Name, is now available from Four Way Books. 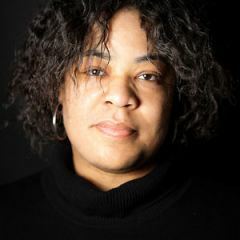 A recipient of fellowships to the Prague Summer Writing Institute, the Fine Arts Work Center in Provincetown, MA, the Vermont Studio Center and Cave Canem, her work has been featured in several journals and anthologies, including Harvard Review, jubilat, Sou’wester, Oxford American, and Lumina and Villanelles. She has taught English and Creative Writing at Medgar Evers College, Drew University, and Adelphi University. She has also led workshops for various arts-in-education organizations in diverse settings. Moon received her MFA in Creative Writing from Sarah Lawrence College.